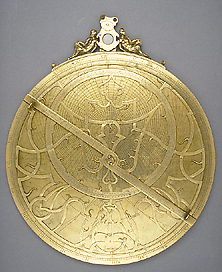 This finely made astrolabe is a typical example of the Flemish influence on European instrument making in the 16th century. The rete shows the tulip shape of the Arsenius astrolabes and the throne consists of two satyrs flanking a centrepiece. The star names are given with their magnitudes and their corresponding planetary temperaments, the plates have both the Horizon rectus and the Horizon obliquus, the mater bears the markings for a quadratum nauticum and the back shows the universal projection as described by Gemma Frisius in his treatise on the 'astrolabum catholicum'.